here i am playing tourist with my boyfriend at Lujiazui earlier this week - it's such a treat when the skies are blue and the sun is shining over the Shanghai skyline! 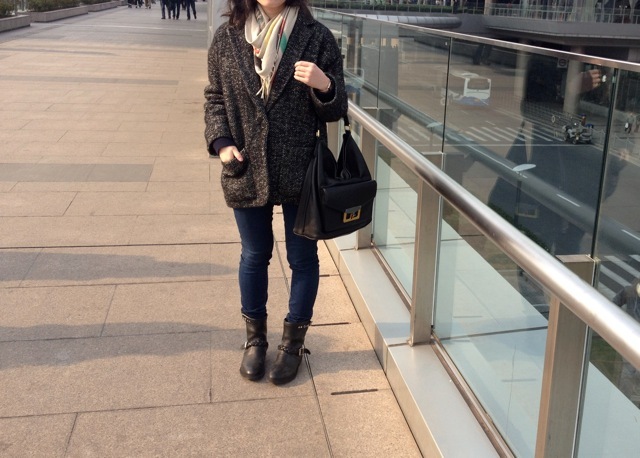 my marant coat, golden goose boots, and MBMJ bag here are all major sale scores from last month. the isabel marant xavier/new 'bator' coat is very cozy and surprisingly warm, thanks to the soft padding throughout the lining. i love the black and white nubby tweed on this one - it kind of reminds me of Edward Gorey's crosshatching drawings, and gives the coat a very nice weight without being too heavy. NAP had sold out of the 0, but the 1 is actually perfect as it's a little longer and the perfect mid-length. the sleeves are slightly cropped to a bracelet length, so they hit right at my wrist. i was a bit nervous about the fit and material as i didn't have a chance to try it on before ordering it online (had to get my boyfriend to bring it over for me), and IM Etoile pieces can be rather hit or miss. but all in all, the xavier coat is worth every penny, and my new favorite fall/winter foundation piece. what are your favorite foundation items in the new year? The IM coat and scarf look like they were made for you (I'm not sure how a scarf looks "made" for someone, but it does), and I see what you mean about the coat's texture and it's similarity to Edward Gorey. My favorite foundations so far for 2012 are my crew neck sweaters and my fall coat. Seeing as the winter's been pretty mild for me both at home and school, a warm sweater combined with a mid-weight jacket has struck the perfect balance between staying warm and not overheating. Happy 2012! THe coat looks great on you! I'm so glad that it worked out! the xavier looks perfect on you! even my baki holds up in 20-30F temps with a wool sweater, and it doesn't have any padding. i love your boots, too. they look like they'll last a long time. I see the similarity to the drawings. Nice bag too, I usually find MJ bags to be obnoxious looking, but that one is very discreet and classic. Good choice! So far I see myself sticking to the same ole' same ole' black pants, long cardigans, and black tees. I wasn't so charmed by the look of the jacket on its own but it looks great on you. All the things I loved last year (button downs!) I still love this year, so I;m hoping to stay in love with them, and stop fidgeting for more! I love the coat on you, and I'm so glad that you're happy with the material. I got some good foundation pieces on sale as well, and I've found the Bator!! You look great! All these pieces look cool together and will work wonders on their own too. Lately, I can't seem to take off my merlot colored J. Crew puffer vest I bought a couple of years ago. So warm and toasty and actually looks kinda rugged-chic layered over just about everything. Wow! That jacket looks great on you. I got the IM Ina when everything went on sale this winter, but I'm so undecided if it's at all flattering... This gives me a little more hope that it is! @Nay'Chelle hi there and thanks for your sweet comment! :) happy new year to you too! the IM scarf has been indispensable. i hope she makes this scarf again in the coming seasons! @erica thanks :) ooh that's good to hear about your baki. i'm over the moon about the coat and GG boots - so comfy and goes with everything in my closet! @Prêt à Porter P ha! i know exactly what you mean. i really like the bianca line of MBMJ bags - elegant hardware and you get the great durable leathers that MBMJ is known for. been toting my hobo all around town lately and it's such a versatile bag! @grechen thanks! :) i love your JD billy in burgundy that's been in your outfit posts lately. hope you had a wonderful holiday break! @lin hehe - i think a lot of IM's pieces are that way. it was a risk getting this online sight unseen but i'm glad it all worked out! @Maja H hehe i know what you mean! your favorites sound perfect - love me a cozy knit with skinnies and boots this time of year. @Garderoben the xavier is very i diiiieee for your bator find! so amazing. i think i remember you saying you were holding out for the bator for seasons now. congrats! @chic_e thanks! :) love a great puffer vest - it's pretty much indispensable here where an extra cozy layer indoors is almost more necessary than when you're out and about! @anullac i'm sure it is - just play around with ways to wear it in stylish and comfy ways :) what color is yours? @Lindsay K thanks! the slouchiness of the coat makes layering a snap. definitely an improvement over my last fitted peacoat. Wow I really hate writing those 'I love your [insert garment]' but I think this is pretty much what I'd love to say about your IM coat. I'd love to see it styled with an even more vibrant colored scarf and heeled boot! @Sam thanks! :) i've been wearing it nonstop - looking forward to doing more posts with different styling! seeing your post about the bator and xavier got me thinking and wanting this coat! i was lucky enough to find it on sale at stuart & wright in bourdeaux. LOVE it! it even help up to 27 degree chicago weather today with mild layering; i am impressed. good luck and let me know if you get it! thanks so much! i went ahead and bought the T2. i recently bought (& then returned) the xabi in T3 but it was much to big, especially in the shoulders. here's hoping the 2 is a win!